Explanation: How did these Martian rocks form? As the robotic Curiosity rover has approached Pahrump Hills on Mars, it has seen an interesting and textured landscape dotted by some unusual rocks. 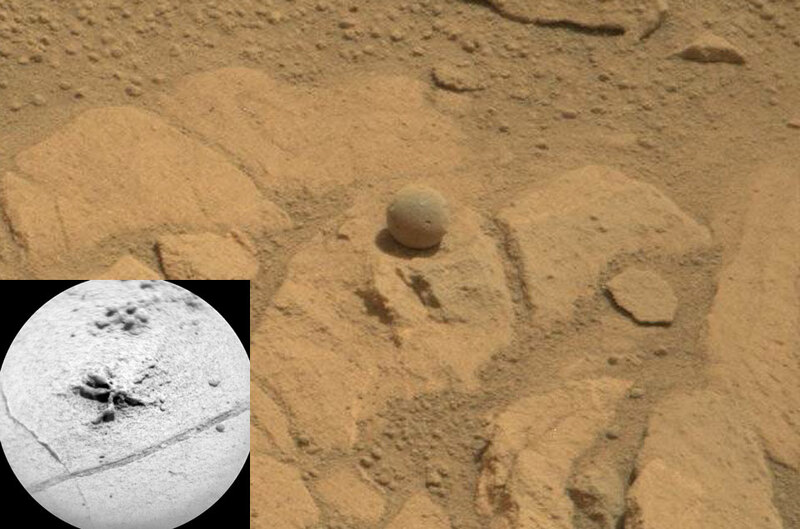 The featured image shows a curiously round rock spanning about two centimetres across. Seemingly a larger version of numerous spherules dubbed blueberries found by the Opportunity rover on Mars in 2004, what caused this roundness remains unknown. Possibilities include frequent tumbling in flowing water, sprayed molten rock in a volcanic eruption, or a concretion mechanism. The inset image, taken a few days later, shows another small but unusually shaped rock structure. As Curiosity rolls around and up Mount Sharp, different layers of the landscape will be imaged and studied to better understand the ancient history of the region and to investigate whether Mars could once have harboured life.